Nothing can prepare you for the unbridled thrill of walking over a bridge, and then walking back the other direction! 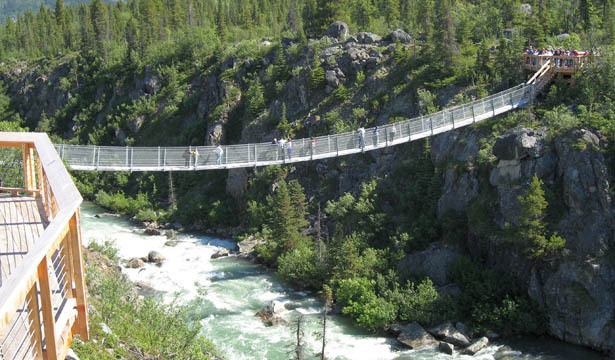 Suspend your disbelief as you traverse the Yukon Suspension Bridge, located in British Columbia. You will have a bird's eye view of the raging Tutshi Rapids after being dropped off at the facility, which also features a gift shop and a couple of exciting interpretive displays. This tour not only covers the near-10 year history of the bridge, but includes stops at some spectacular natural area like the White Pass Summit, and Tormented Valley, which is like a moon-scape if the moon had trees, water, and an atmosphere. Passport Required. Jacket recommended. This tour can accomodate groups. If taking this tour, we reccommend that you have no fear of heights.